Amodel 1/72 T-4 "one hundred"
NOTES: Interesting offer of a failed cold war warrior. Finally, I get to beat the editor to a topic. Being an aero engineer by avocation, I am fascinated as to how the “other guy” solved the same problems. Out of that I have an overly active curiosity about Soviet and Swedish aircraft. When I saw this bird on eBay I knew I had to have it. The cold war really was a race. We developed the F-100 to counter the Mig-17; The Soviets tried several and finally developed the MiG-25 to counter the B-70. Ironically both superpowers had still born Mach 3 fighters to counter each other’s long-range bombers. The US program was the F-108; the only piece of Soviet hardware to fly was the Sukhoi Su-4 (100). 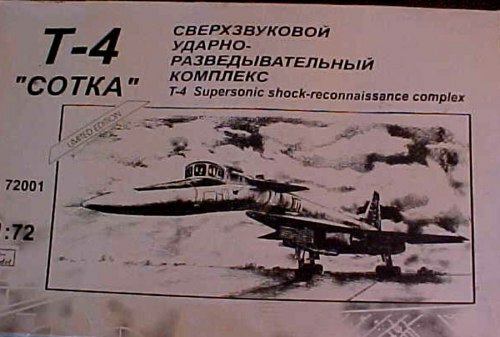 Ironically along the way the Su-4’ mission changed from interceptor to a tactical bomber and reconnaissance aircraft. The program caused all sorts of problems in the Sukhoi fighter design bureau. Its in plant moniker “100” was a reference to its predicted 100 metric ton flying weight. Built mostly of titanium and the size of a bomber it was a strain on Sukhoi’s design department. Eventually the first of three airframes was completed and flown for the first time on 22 August 1972. But due to budget restrictions the program was canceled after 10 flights and 10.2 hours in the air. This aircraft broke all new ground in titanium production and Fly by wire technology. Design goals were Mach 3.01 cruise at altitude of 78,000 feet. Who knows, if the frontal aviation units didn’t need so many MiG-23s then the VVS may have had its own SR-71 competitor! My Amodel kit was bought through an eBay seller in Canada with contacts in the Ukraine. The kit came with the major sprues, instructions and decals wrapped in a heavy plastic bag. This bag and the major portion of the airframe were then wrapped in the flattened box, which in turn was wrapped and taped in a heavy plastic bag then boxed to be shipped to the US. In other words I was slightly disappointed in the way the kit arrived at my doorstep. Now for the first surprise. 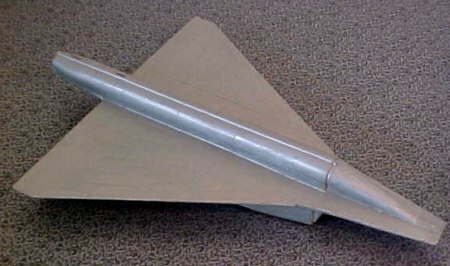 The wings, upper and lower fuselage appears to be “blow molded” in a single piece of oily feeling silvery-gray plastic. The separate vertical fin is molded from the same material. The instructions call out the use of CA to glue the other components on to these main parts. 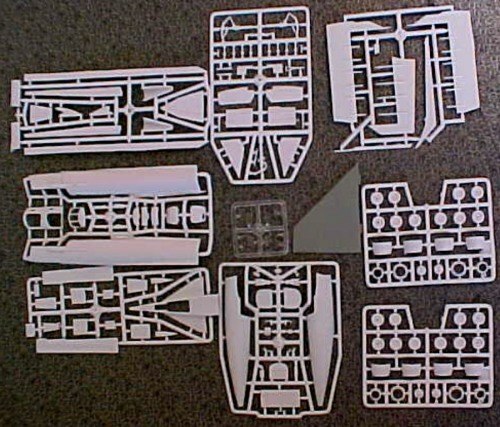 The remainder of the kit is on eight sprues in white and one in clear. Molding is a little heavy but the norm for the short run Eastern European kits. The kit has a full cockpit with bulkheads, floors, instrument panels and ejection seats. The crew hatches may be glued open or closed. The Concord-like drop nose is hinged so that it may be positioned up or down. And there is the usual choice of gear up or down. The instructions consist of nine steps on six pages. “Soviet X-Planes” by Yefim Gordon and Bill Gunston.